“You took over our advertising — now are you going to take over our news?” — a question from a San Francisco Chronicle journalist to Craig Newmark, founder and CEO of craigslist.org. Craigslist.org has dominated the classified advertising market with its free listings for everything from real estate — to jobs — to personals. Big city newspapers, like the SF Chronicle have been crippled by this new kid on the block. How much traffic does craigslist get? Q: How does that compare with other companies? Q: How many classified ads does craigslist receive? The average user/reader spends so much time on the site–about five days a month, 20 minutes per day–the site ranks a startling seventh in terms of monthly page views. This is 4 billion page views per month. A billion here, a billion there, now we are talking about real readership numbers. So how exactly does Craigslist make money? By charging $25 for job postings in six of its largest U.S. markets and $75 for job listings in San Francisco and by assessing a $10 fee for brokered apartment listings in New York City, according to their website. Classified advertising was the real money-maker for newspapers. Want ads, are the little ads placed by individuals. They were not only the most profitable for newspapers on a word-for-word basis, they also generated great readership numbers, a fact that was lost on ALL of the newsrooms in America. The editor-centric news “executives” had not bothered to do any research on the readership of the ads that paid their salaries. They mocked MBAs, IT and celebrated BAs from America’s most liberal J-schools. The arrogant editors who “manage” the entire newspaper enterprise, didn’t have a clue. They thought that they called the shots. People were paying 25 cents to read the ads just and a few pages of news and entertainment. Let’s not bury the lead: This is a rough time for the newspaper business, a rough time for The Washington Post and a rough time for me. No one need shed any tears for the people leaving this building. The more than 100 journalists who have just taken early-retirement packages are voluntarily accepting a generous offer as the company trims its payroll — a situation far better than at newspapers that have resorted to layoffs. With advertising revenue sinking and classified competition from the likes of Craigslist, newspaper market values are taking a hit. Avista Capital Partners, which bought the Minneapolis Star Tribune 14 months ago, recently had to write down 75 percent of its investment. The purchase price had been $530 million; the previous owner, McClatchy Newspapers, paid $1.2 billion for the paper in 1998. That’s just a few pieces to the puzzle of what went wrong. It’s not unlike the fall of family-owned business, where the next generation of trust-fund brats drain the profits and only find interest in the fun, ivory tower aspects of the business. In these sob stories of more layoffs, there isn’t any mention of the marketing/advertising departments, because the editors have no interest in that aspect of the media. If newspapers were run like real companies, there would have been “big picture” studies of trends and competition. How’s this for an idea, cut out five top level editors and buy 100 servers, two webmasters and one internet marketing guy. Newspaper editors have been selective in what they deem fit to print. Like Hillary’s wrinkles. Now we know Hillary looks like a Chinese Shar-Pei when her file photo isn’t shot through filters and put through some PhotoShop work. Why has it taken so long for the mainstream media to show us the real, unfiltered photo of Hillary? In an article in the Atlanta Journal-Constitution, former “journo” and current professor David Hazinski seems to imagine that it’s the job of the “news industry” to “monitor and regulate” the content of blogs and Internet journalism. I’m serious, he really said that! This self aggrandizing piece is so filled with blind assumptions and presumptuous fill that it might even be judged a farce and satire. But this liberal is serious. BTW-Now we know that “professiona photo journalists” have been filtering the lense and smoothing photos of Hillary Clinton to promote her campaign. Exactly the same tacktic was used to prop up FDR, he was never photographed in his wheelchair. The real face of Hillary. 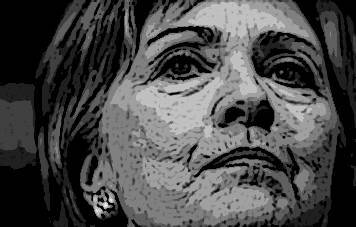 Hillary in flop sweat–using good cop, bad cop tactics on Obama. Why did the press wait until now to print the wrinkled hag photo of Hillary? Hillary Clinton’s campaign bus has had one wheel fall off and is on its way to rolling over in a ditch along an Iowa farm-to-market road. The national biased polls that her campaign chooses to publish, aren’t even looking much better. The real, unfiltered look at Hillary. Why was this the first photo in focus? Is it because the liberal press sees a loser? 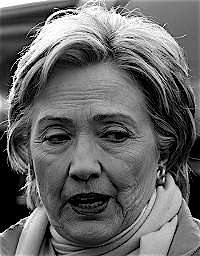 This Sunday, the NY Times sees that Hillary is a lost cause–so they are going to drop the bomb with an expose on her illegal campaign donations and list of donors to the Clinton Library. Update: that came out and passed without much a blip. But the Obama surge gains momentum. BOB KERREY (A Hillary Supporter): “It’s something by the way I have told Barack Obama when I’ve met with him. It something that I’ve spoken about before. 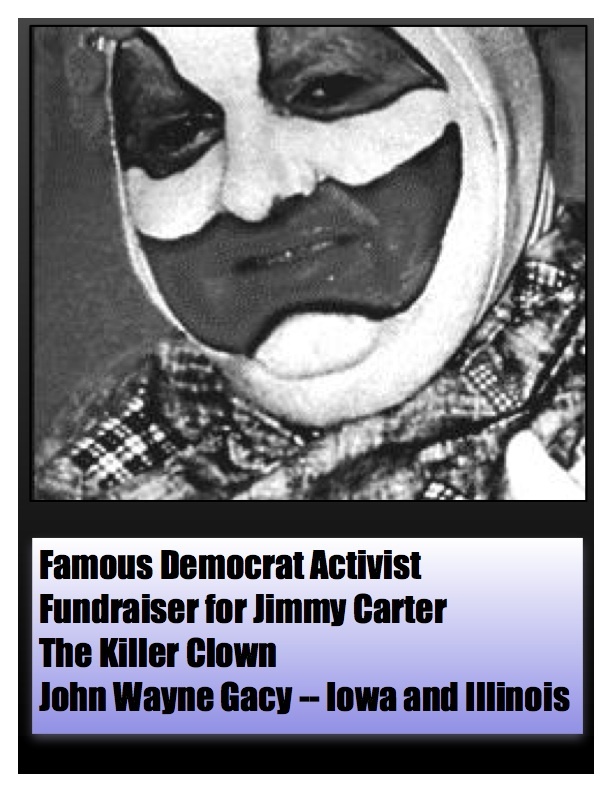 So this is not something that just sort of came out of the head birth out there in Iowa. I’ve thought about it a great deal. I’ve watched the blogs try to say that you can’t trust him because he spent a little bit of time in a secular madrassa. I feel quite the opposite. I feel it’s a tremendous strength whether he is in the United States Senate or whether he’s in the White House, I think it’s a tremendous asset for him. That is a pretty good hit against Obama. Very underhanded. Watch Hillary pull more last-chance dirty news drops on Obama during the Christmas holidays. Of course, Hillary will say she had noting to do with it. And the mainstream media will not be reporting the behind the scenes strategy. You will need to read blogs for that. It’s too late. Now the Washington Post has joined the wolf pack with Hillary’s “hangdog” photo. The hangdog candidate photograph is a weapon in the war of attrition. They are easily gathered, because no politician can be completely upbeat every day of every week for two years of solid campaigning. All it takes is one tired moment, one puffy-eyed, early-morning, haven’t-had-the-coffee-yet photograph, and the image is in the arsenal. Even better is if the candidate lets down his or her guard momentarily in the presence of another candidate, so that, say, Barack Obama can be seen looking happy and confident as Hillary Clinton looks tired and depressed in the same frame. In the partisan media (much of the blogosphere, the tabloids and several cable channels), these images are used freely and gleefully. In media that strive for objectivity, the hangdog shot raises difficult issues. In an earlier age of newspapering, sorting through the archives for an image that confirmed your headline was acceptable practice. Today, serious newspapers try to use images from the most recent campaign events rather than something a few months old, even if it fits the story line better. Will the insider story from a former Clinton White House aide be covered by the mainstream media? Kathleen Willey, is a former White House Aide who has accused then president Bill Clinton sexually groping her in the Oval Office the day she found out her husband was found dead in a park, (suicide similar to Vice Foster). Her new book, Target: Caught in the Crosshairs of Bill and Hillary Clinton, contains riviting testimony and stark revelations on the Clintons has been released today. The book definitely has some negative effects on Hillary Rodham Clinton’s and Obama’s 2008 Presidential ticket. Ms. Willey’s book contains repulsive details that could put a dent in Sen. Hillary Clinton’s presidential campaign, including accusations of campaign finance violations and new descriptions about harassment and threats by the Clintons and their associates. Willey also identifies the person who threatened her just prior to her testimony against President Clinton — a man who turned out to be paid by the Clintons. Last September, Willey was the target of an unusual house burglary that nabbed a manuscript for her book, while little else was taken from her rural Virginia home. The break-in, she said, reminded her of the widely reported incident 10 years ago in which she was threatened near the same Richmond-area home by a stranger just two days before she was to testify against President Clinton in the Paula Jones sexual harassment case. Willey believes the recent break-in and theft were prompted by the teasers of her book’s contents published that week in U.S. News and World Report’s “Washington Whispers” column and the New York Daily News. Willey says she wrote the book because of persistent misunderstanding about what happened 10 years ago. The truth has a way of coming out in the end.